My name is Chris Harrison. Graham invited me to contribute to this blog. Here’s a little bit about me. I ride several times a week. I commute by bike and also squeeze in a couple of longer rides a week during good weather. My wife and I have 3 teenage sons, who keep us fairly busy. I’m a teacher. I love the outdoors. Aside from cycling, I also run, canoe and cross-country ski. I currently have three bikes, but that changes periodically. My road bike is a Surly Pacer. I also have a Trek mountain bike and an old winter bike (a beat-up Raleigh I purchased off Kijiji). My favourite bike is the Surly Pacer. I like it because it’s smooth and fairly fast. Shortly after I bought it, I did a 100 km ride with 4 friends. Before the ride, I was concerned that I wouldn’t be able to keep up, because the rest of the guys all had fairly expensive carbon fiber bikes. I was fine. The Surly handled the ride beautifully! I wasn’t the fastest rider, but I wasn’t the slowest rider either. One of the best rides on my Surly occurred last summer. I broke my ankle near the end of June and had to be in a cast most of July. I got the cast off right at the end of July. The surgeon told my I could walk on it, but not to push things too quickly. I hobbled home and waited a whole 5 hours before going for a ride! 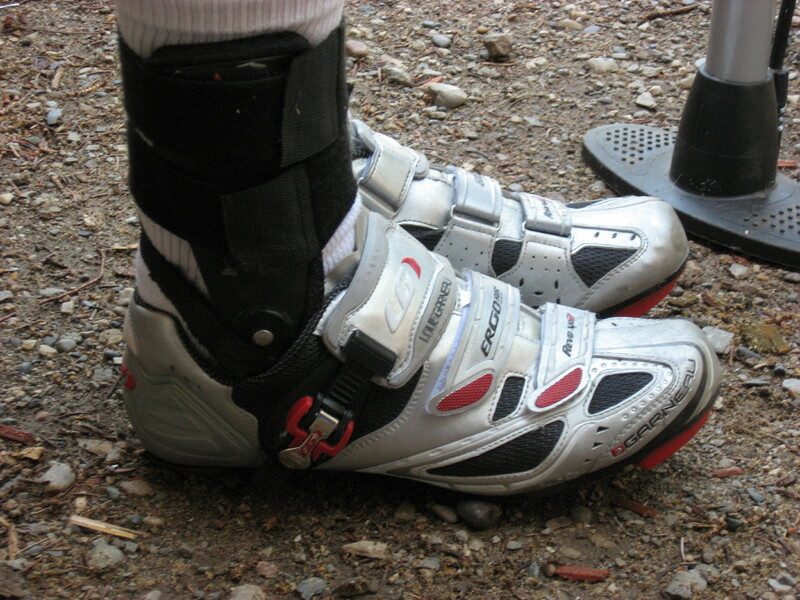 Then I put on an ankle brace and wedged my foot into my cycling shoes. I didn’t push the distance or the pace – 15 km at a little over 20 km/hr, but it was exhilarating! Going down one hill, I got up over 40 km/hr. It is hard to describe the feeling of going that fast in the afternoon, when I had a cast on that same morning, especially after being immobile for over a month! I’ve been riding my winter bike for the last few months, but I’m looking forward to getting out for some long, fast rides on my Surly soon! 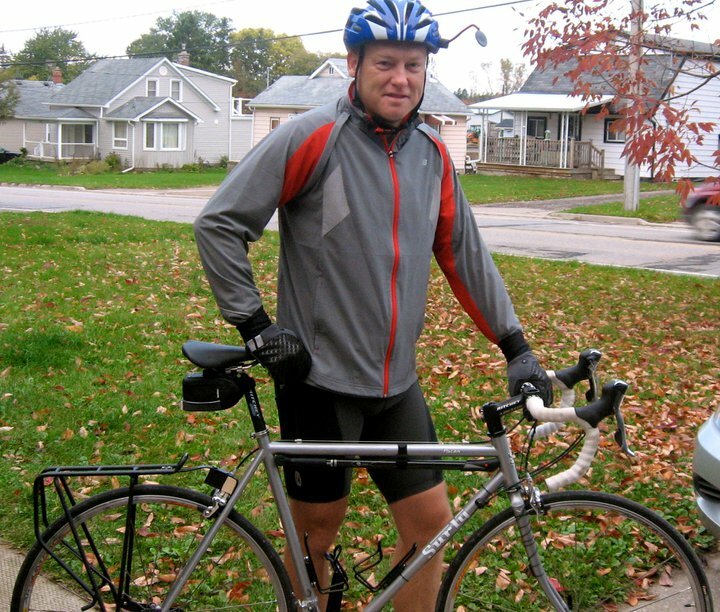 It’ll be good to see some new posts about cycling in Waterloo and the region. Am looking forward to your posts. Welcome Chris! Looking forward to some more local posts and insights! Work has begun on Mill St, from Queen to Stirling. Sort of messes up my normal route to work, but it’ll be worth it to have an improved road! Mill being shut down is tough, but it was in rough shape, so it will be nice when it’s done! Unfortunately both Highland nor Courtland are both busy and probably aren’t as direct as Mill. Hope the commute works out for you! Yep, the work on Mill is long overdue! The sidewalk is still open, so I can still take my normal route to work. Courtland is closed now, too ……… sheesh! So Chris, when’s the next post coming? Looking forward to the new voice? Hmmm, is that encouragement or pressure, Graham? I’m working on one right now. I hope to post it sometime this weekend. About 1 a month will probably be my posting rate. I could probably do more in the summer. How about a discussion of which streets in the region are most in need of bike lanes? Or an update on Lights of Life?